This recipe is a combination of a couple of my favorite quick meals. 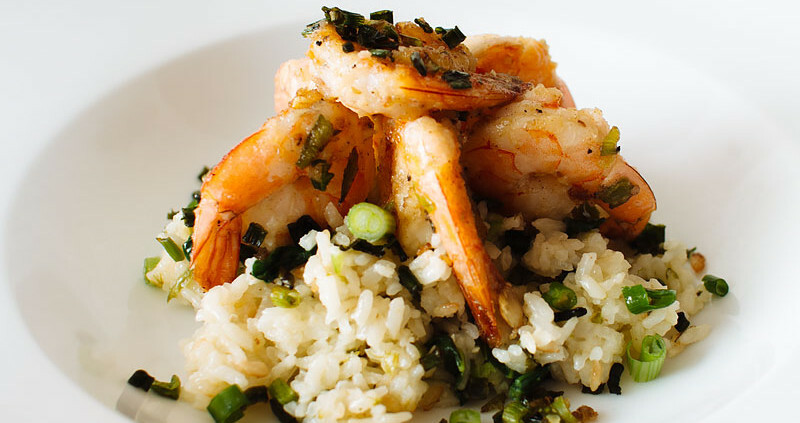 The rice is a great side dish for any Asian-style protein, and the shrimp can be a tasty little appetizer, or pair it with your favorite veggies for a low carb dinner. 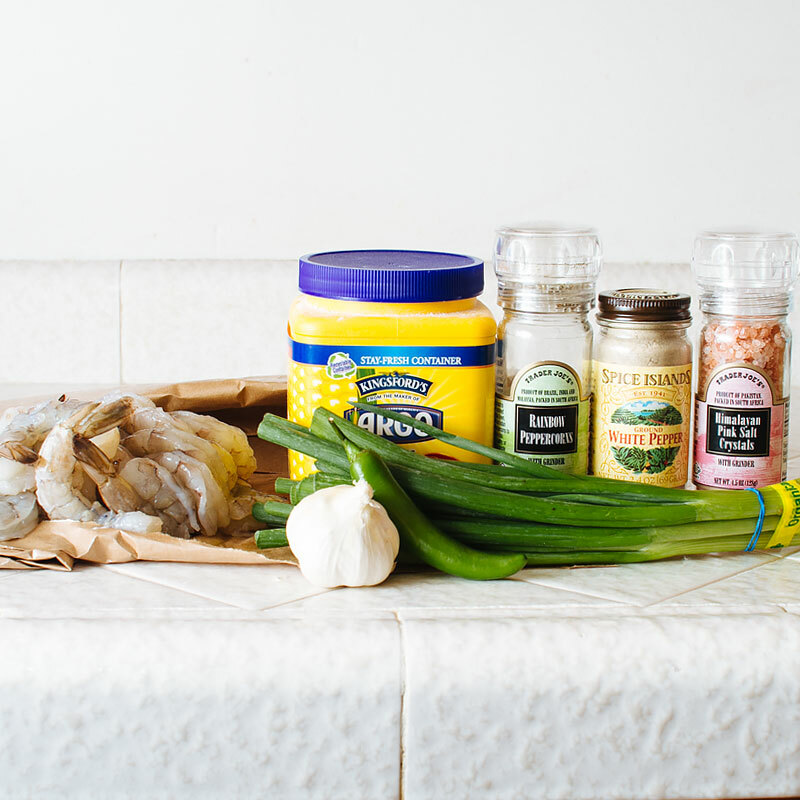 Paired together, however, and you have a super delicious meal that comes together in just about 45 minutes. 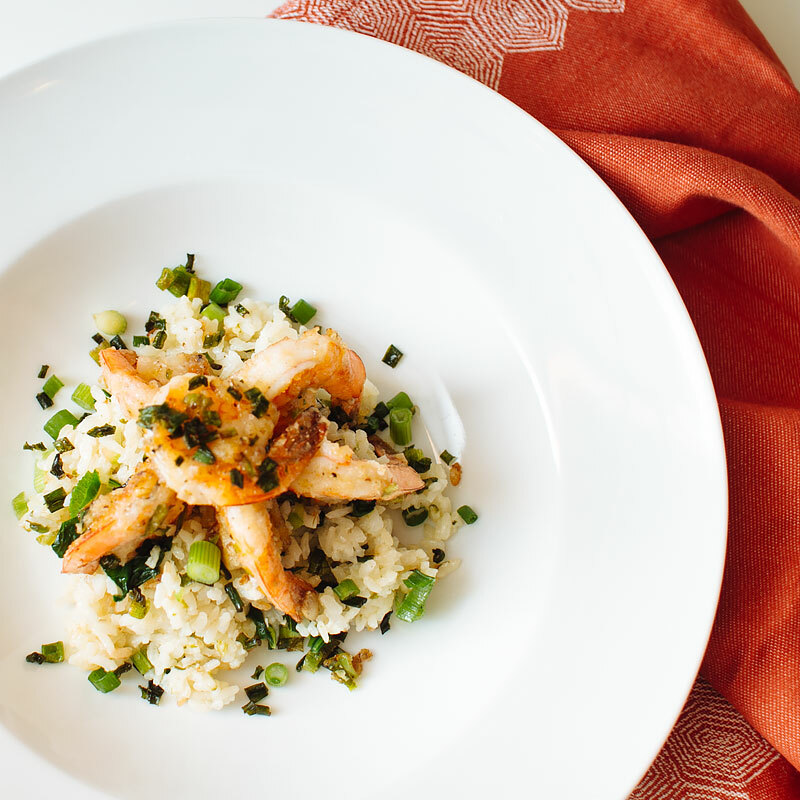 What I love most about this recipe is that it only takes one pot and one pan; one pot to cook the rice, and one pan to crisp up the scallions and saute the shrimp. Yay for not a lot of dishes! 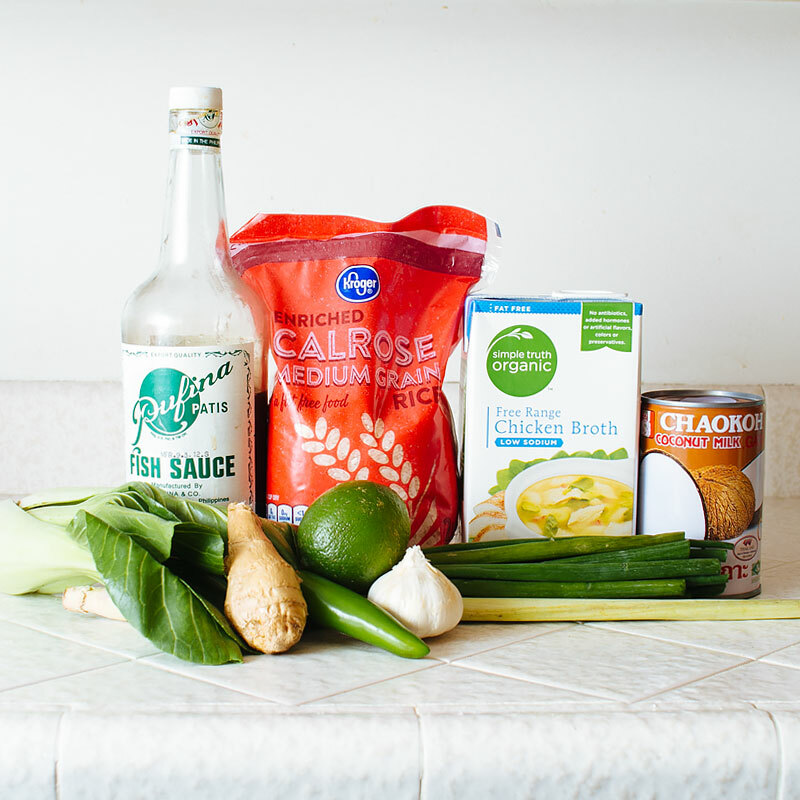 For the coconut rice, you’ll need rice, chicken broth, coconut milk, scallions, lemongrass, lime, serrano chili, ginger, baby bok choy and fish sauce. Heat 1/2 tbsp vegetable oil in a medium sauce pan over medium heat. Saute garlic, ginger, chili and 1/4 cup of the scallions until fragrant, about 1 minute. Add in rice and fish sauce. Stir to coat the rice until it’s shiny. 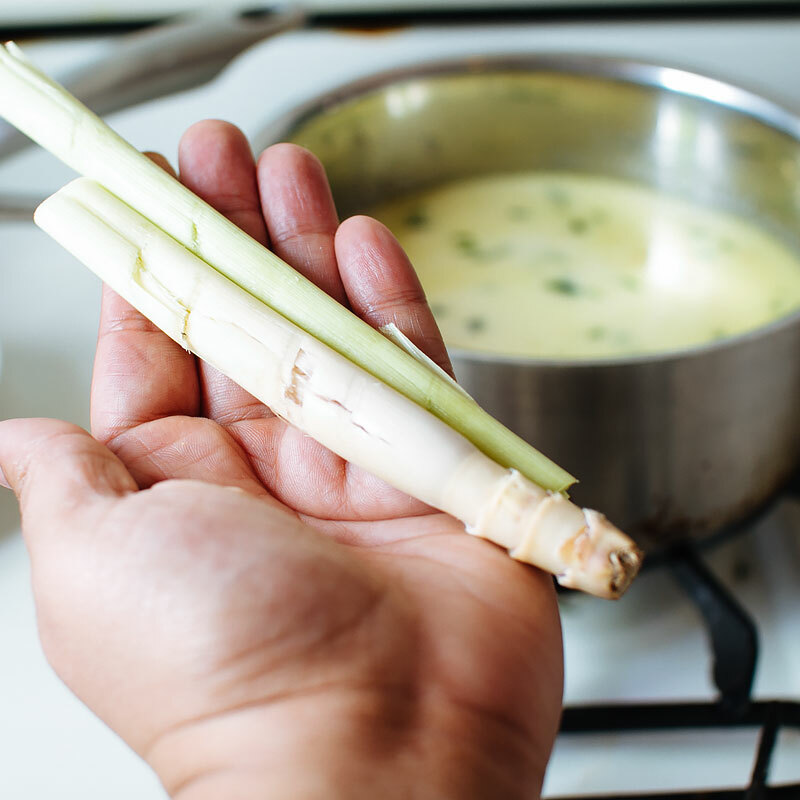 …and the stalk of bruised lemongrass. Cover the pot, bring to a boil then reduce the heat to maintain a simmer. Cook for 20 minutes. 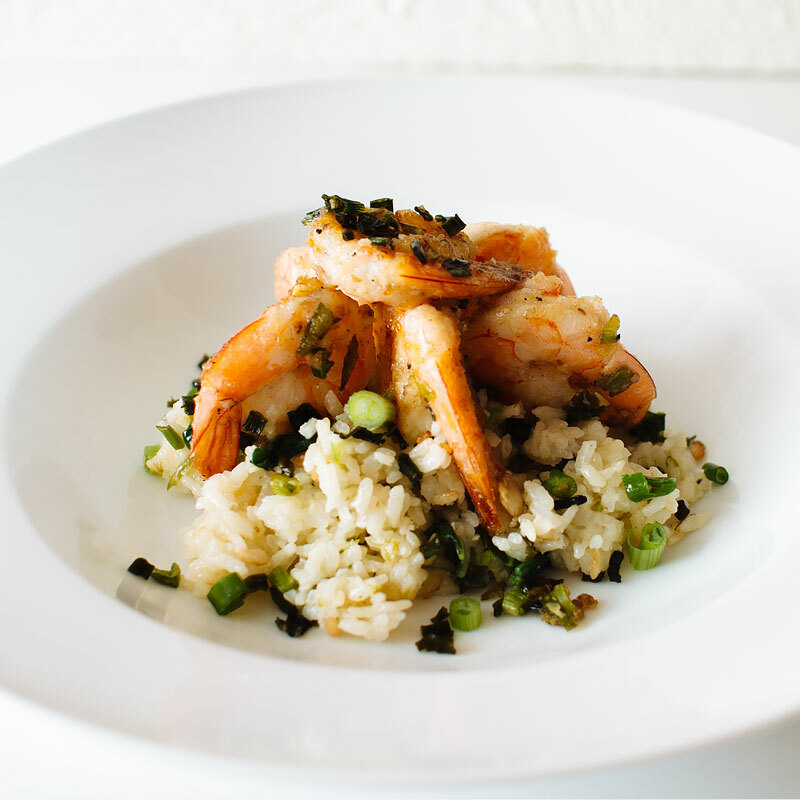 While the rice is cooking, fry up the scallions and the shrimp. 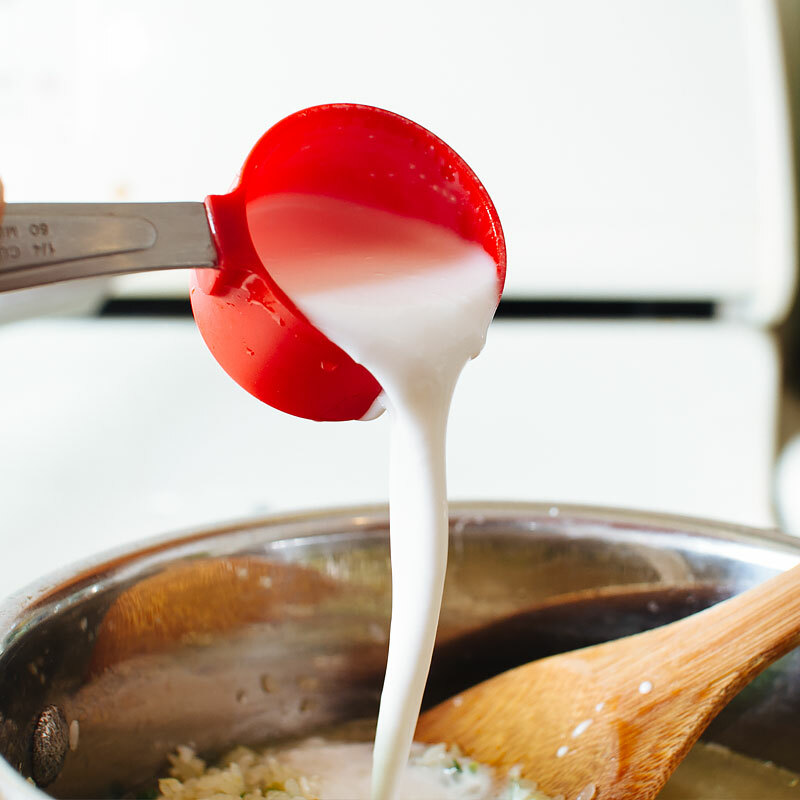 Add 2 tbsp oil to a large pan over medium heat. 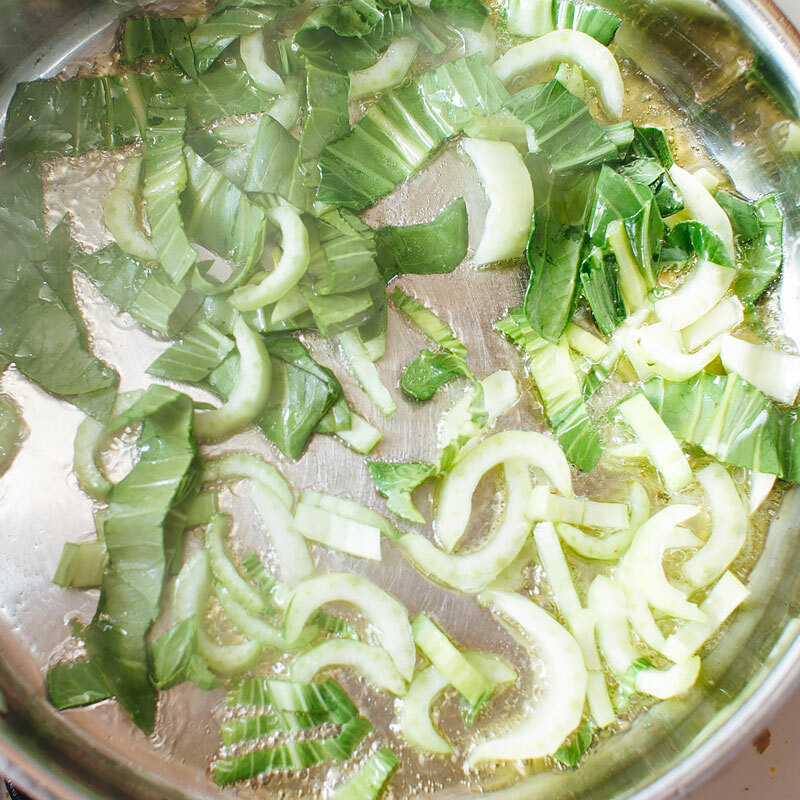 Add in 1/2 cup of the scallions and fry until crispy and the edges are slightly brown, about 5-8 minutes. Drain on a paper towel and set aside. Saute the baby bok choy in the scallion-infused oil until crisp-tender, about 5 minutes. Remove from the oil and set aside. 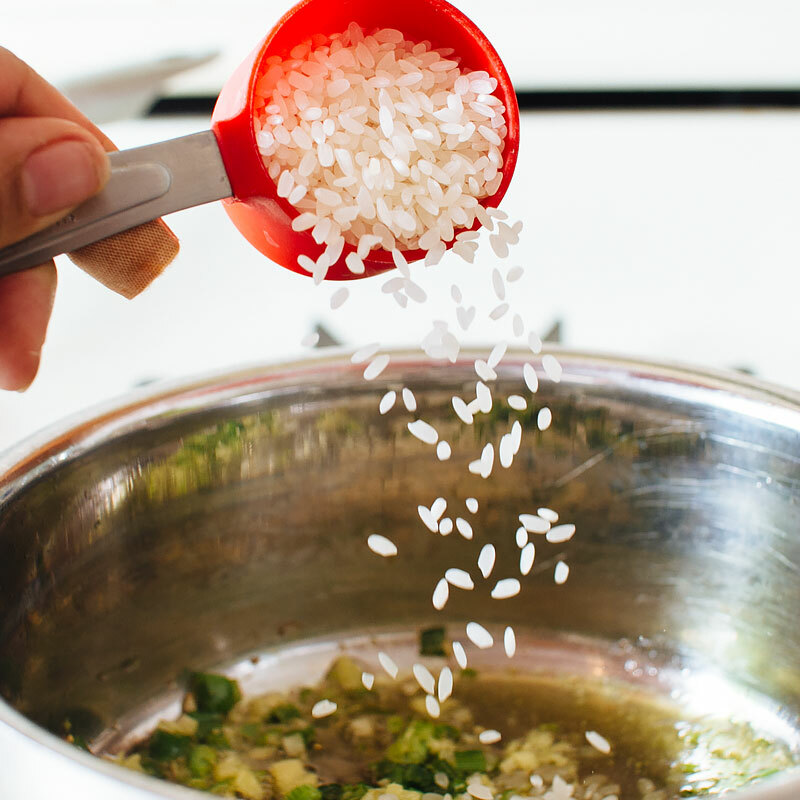 The rice should be done now – stir the bok choy in. Add in the crispy scallions (save a few for garnish) and the remaining 1/4 cup of fresh scallions. 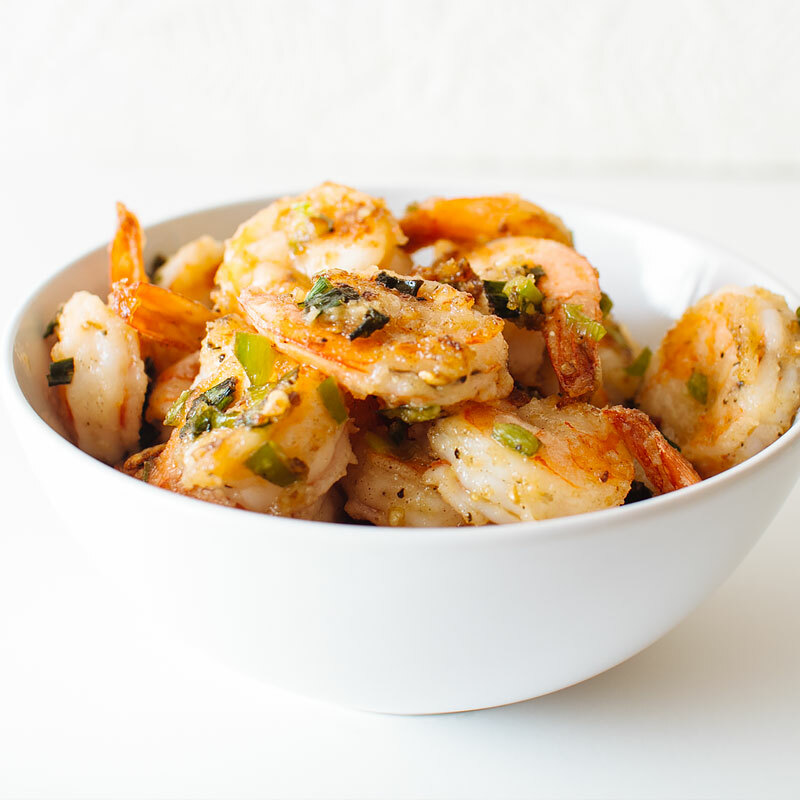 For the shrimp, you’ll need cornstarch, black pepper, white pepper, salt, green onions and garlic. Pat the shrimp dry and toss with cornstarch, salt and pepper. 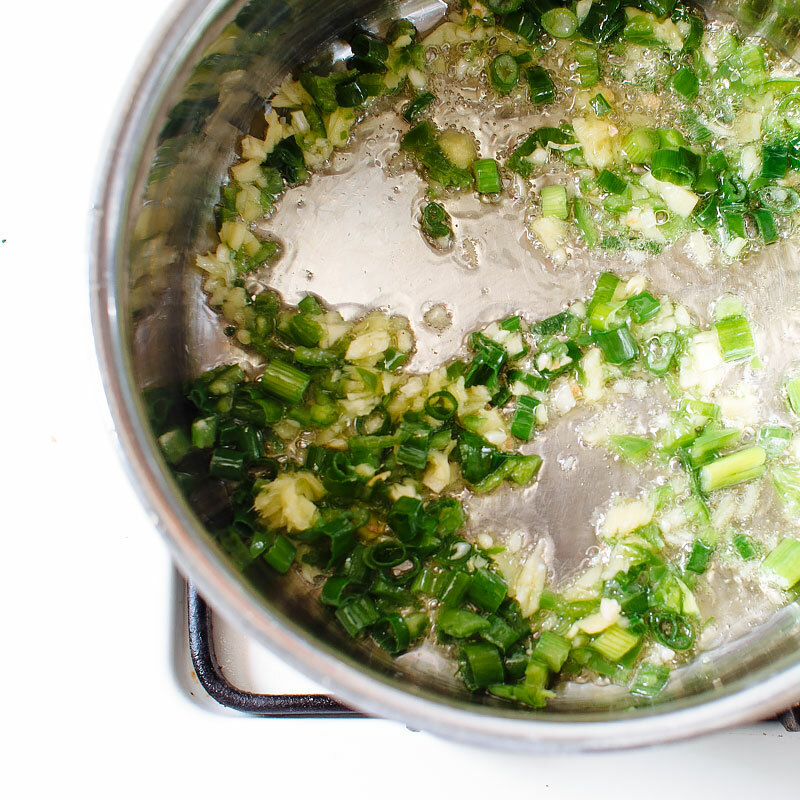 Fry the garlic, chili and scallions in pan with the remaining scallion oil until fragrant, about 1 minute. Add in the shrimp and saute until cooked through, about 1-2 minutes per side. 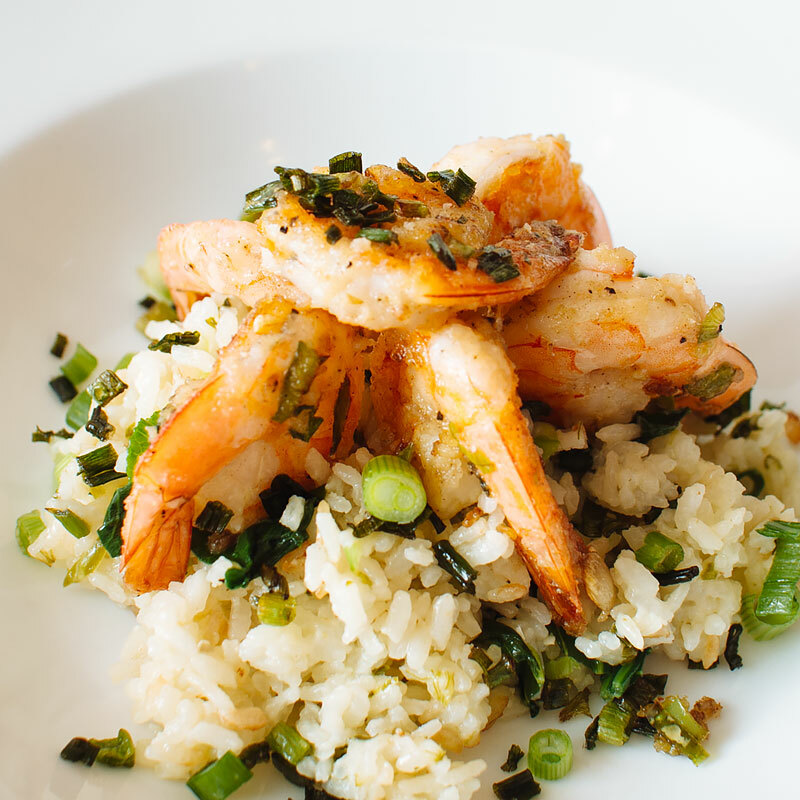 Serve the shrimp over the coconut rice and garnish with additional fresh and crispy fried scallions. In a saucepan, heat 1/2 tbsp of oil over medium heat. Saute 1/4 cup of the scallions, ginger, garlic and chilis until fragrant, about 1 minute. Add in the rice and fish sauce and stir to coat the grains of rice. Add in chicken broth, coconut milk and bruised lemongrass stalk. Cover and turn the heat up to medium-high. Once the liquid begins to boil, reduce the heat and simmer for 20 minutes. While the rice is cooking, heat 2 tbsp oil in a large pan. Fry 1/2 cup of the scallions until crispy and slightly browned on the edges, about 5 minutes. Remove from the pan and drain on paper towels. In the same pan, fry the bok choy until crisp-tender, about 5 minutes. Set aside. 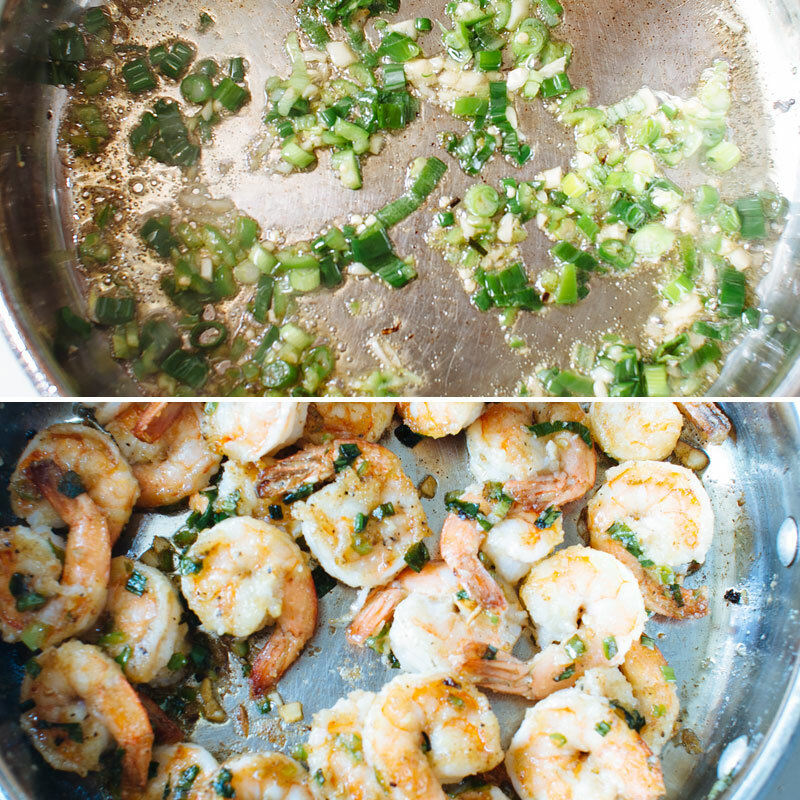 Use this same pan, and the scallion infused oil, to cook the salt & pepper shrimp recipe below. 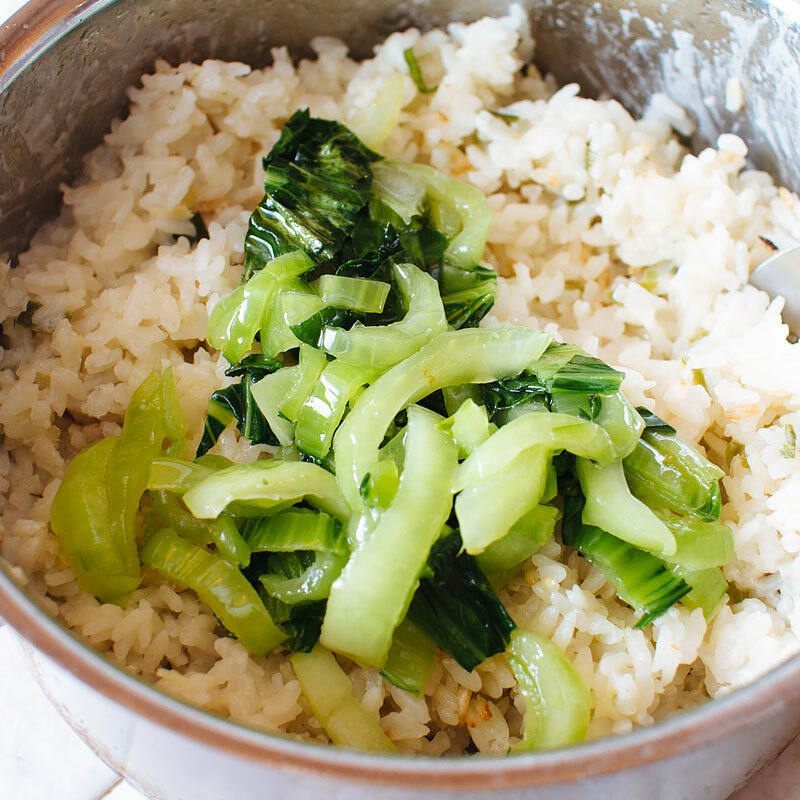 Once the rice is cooked through, fluff with a fork and stir in sauteed bok choy, remaining 1/4 cup of fresh scallions and most of the crispy scallions, reserving a few for garnish. 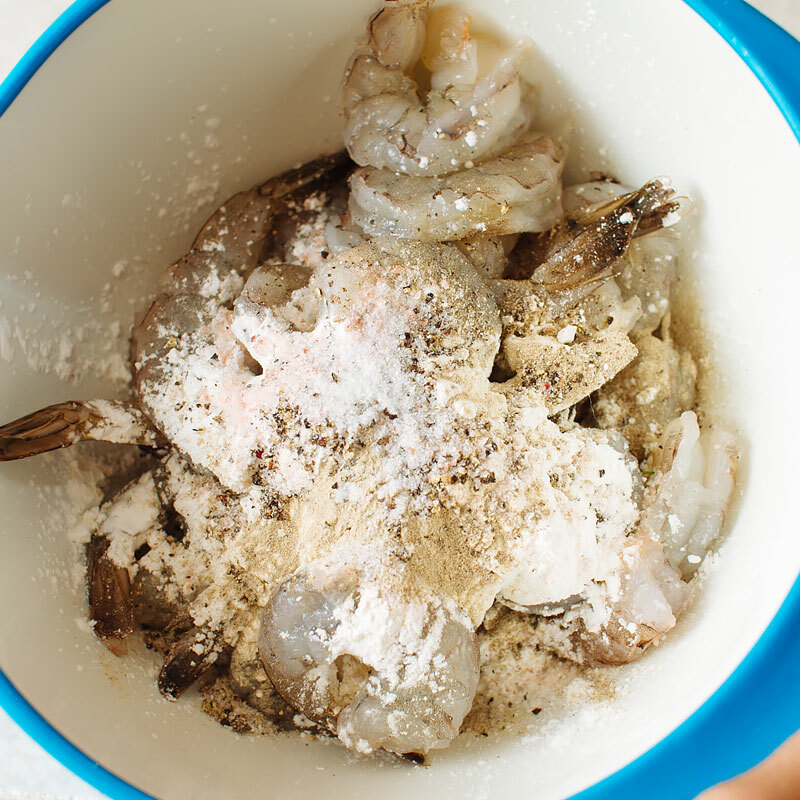 Pat the shrimp dry and toss with cornstarch, ground pepper and sea salt. 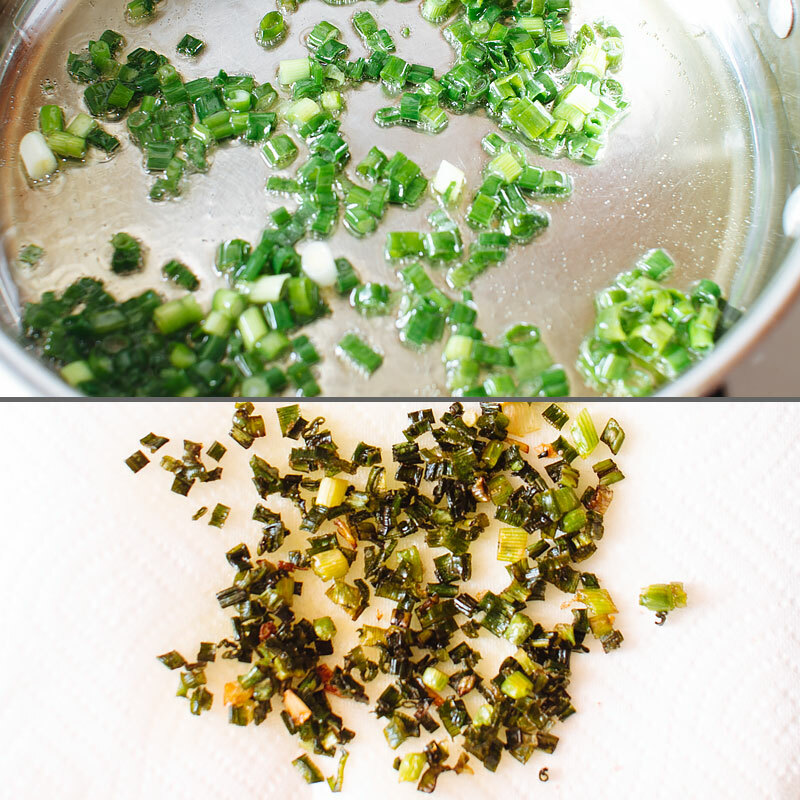 In the same pan with the scallion oil, saute the garlic, chili and scallions until fragrant, about 1 minute. Add in the shrimp and saute until cooked through, about 1-2 minutes per side. 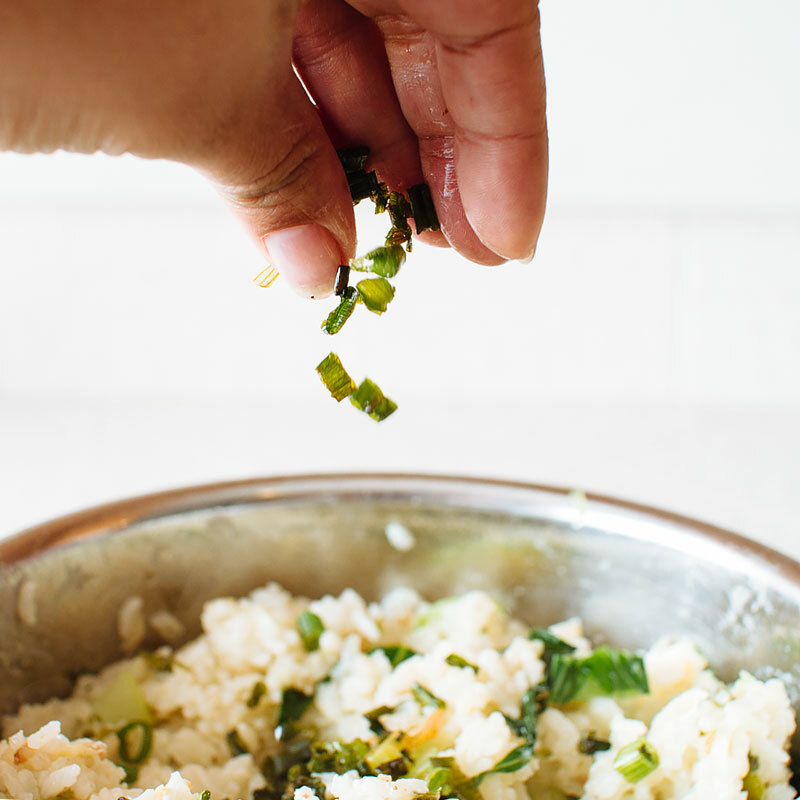 Serve over crispy scallion coconut rice with additional fresh scallions for garnish. Squeeze a wedge of lime over the top to finish. YUM! 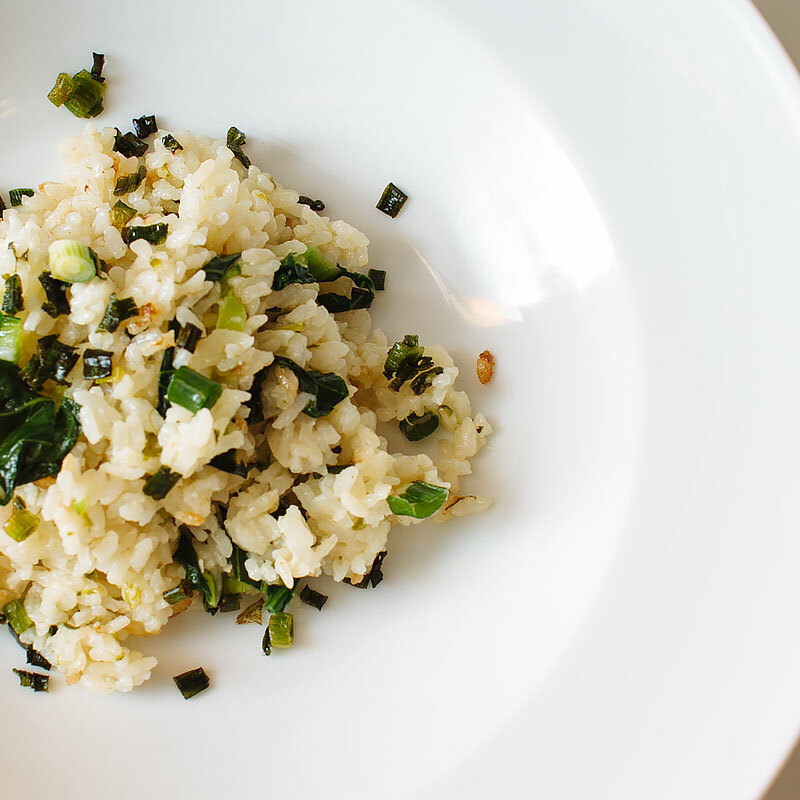 The Crispy Scallion Coconut Rice looks and sounds amazing. I could eat that all by itself! Pinning! This looks and sounds like a perfect dish! Love shrimp! Coconut in rice is everythingggg. I started adding coconut milk and toasted coconut shreds to this fried rice I make and it weirdly works with all the other stuff I throw in there (scallions, eggs, cashews, etc.). And love that you added cornstarch to give the shrimp the slightest golden crust…I need to remember to do that next time I cook shrimp!